The UC San Diego Department of Visual Arts awarded artist Heejung Shin the inaugural David Antin Prize. Named after poet, artist and founding member of the department, the prize is given to a graduating MFA student who not only shows originality and creativity in art practice or criticism, but who reflects Antin’s focus of interdisciplinary work and the use of multiple mediums. Now an alum, Shin said she is grateful for the honor and expressed thanks to Cross, who was supportive and encouraging as she faced cultural and language barriers. Her time at UC San Diego shaped her art in many positive ways, she said. 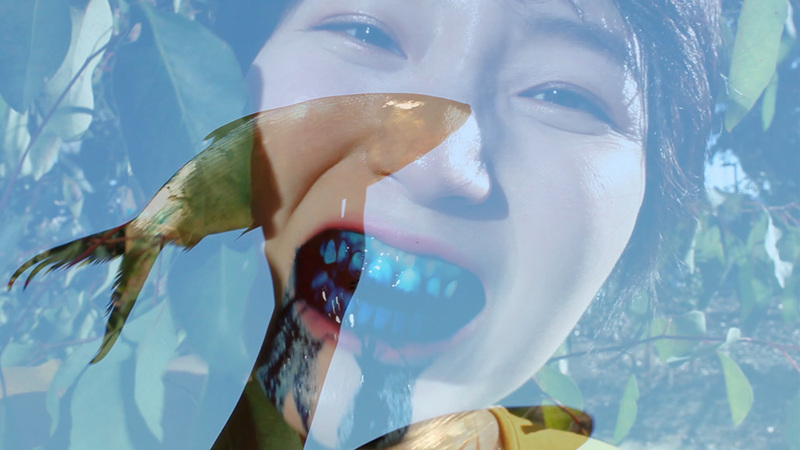 “I hope my music-video works would empower ‘othered’ bodies in this xenophobic world, and create imagination in between: not only for marginalized ones, but also people who have internalized patriarchal ideas,” Shin said. After receiving her BFA in painting and design from Seoul National University in 2012, Shin attended UC San Diego for her MFA, graduating in June 2018. While there, Shin received an Academy of Korean Studies Graduate Student Summer Research Grant and a Russell Grant. She won the first place Emerging Artist award from Casa Familiar’s FRONT Arte Cultura in 2018. The David Antin Prize was established by an endowment following the death of David Antin, an accomplished artist, poet and art critic who helped shape the Department of Visual Arts from its inception. Antin served as the educational curator for the Institute of Contemporary Art in Boston before joining the department in 1968. He began teaching courses full time in 1972, covering Structure of Art, History of Criticism, Theories of Modernism and Postmodernism, and Narrative Theory, among others. Antin’s graduate work in linguistics at New York University — where he mapped the language structure of Gertrude Stein — led, in part, to him helping to establish the university’s New Writing Series, with recordings now kept in the Archive for New Poetry at the UC San Diego Library Special Collections & Archives. In 1987 and 1988, Antin produced “Sky Poems,” using a team of aerial skywriters to present lines of poetry above the beaches of California, including La Jolla. On Sept. 29, the poems will appear again over the Los Angeles County Museum of Art and the Museum of Contemporary Art San Diego, with the daylong event beginning at 11 a.m. in La Jolla. On Sept. 27, coinciding with this historic restaging, a group of poets, artists and scholars convened to commemorate Antin and his legacy at the Hammer Museum in Los Angeles.